Enjoy truly unique Center City apartments for rent. Trinity Row is a set of 19th-century brick and brownstone townhomes, capturing the distinct character of historic row homes. Repurposed from single family homes, Trinity Row’s history has always been dedicated to exemplary urban living experiences. 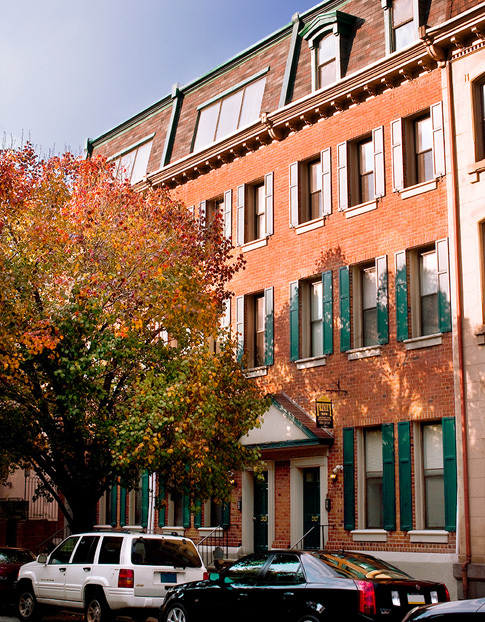 Amidst a quiet neighborhood populated by cultural institutions, churches, and charming local businesses, the 1- and 2-bedroom bi-level Center City Philadelphia apartments preserve their colonial architecture. Brick walls and wood beams are highlighted by split-level loft designs and contemporary upgrades to bring these brownstone apartments into the modern age. Trinity Row’s location is the ideal answer for convenient Center City apartments for commuters. On a tree-lined street, Trinity Row combines city amenities with the peaceful atmosphere of home. Learn more about the reasons to live in Center City Philadelphia.